Courtesy of the artist and Michel Rein, Paris/Brussels. 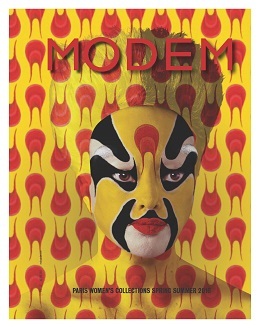 For this edition of Modem, which is dedicated to the Women’s Spring/Summer 2016 season, we gave “carte blanche” to ORLAN, one of today’s most important living French artists. ORLAN uses sculpture, photography, performance, video, 3D, video games, and augmented reality throughout her body of work, as well as scientific techniques, such as surgery and bio-technology. The artist quickly became a major figure of the body art movement, or more specifically of ‘Carnal Art’, which she defined in her 1989 manifesto. In 1964, ORLAN initiated her own re-invention process, and therefore changed her name to ORLAN, written in capital letters, and created “ORLAN accouche d’elle m’aime” (“ORLAN gives birth to her loved self”), with the aim to abolish her biographical and physical existence for the sake of her work. 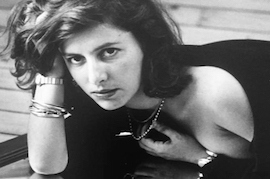 A pioneer in the history of performance art, she achieved great success with “The Artist’s Kiss” at the 1977 edition of FIAC in Paris, as this controversial performance became subject of a scandal and shook up her career and life. In 1978, she founded the International Symposium of Performance in Lyon and put an emphasis on a recurring performance project named “MesuRages”, in which she would use her own body as a as a unit of measurement, called the “Orlan-body”. In this context, she measured iconic places, such as the Centre Pompidou in Paris, the Andy Warhol Museum in Pittsburgh (US), and also the M HKA in Antwerp, Belgium, among others. In 1990, when she decided to use cosmetic surgery as an artistic medium, the operating room became her workshop where she programmed satellite video broadcasts of her procedures of plastic surgery. Since 1998, ORLAN uses the technique of morphing to merge her face with past facial representations from the New World, giving birth to a mutant beauty, located at the crossroads of Western culture to non-Western culture. Today, ORLAN continues to be a pioneer artist by using new techniques and technologies. One of her latest series, “Masques de l’opéra de Pékin” (“Beijing Opera Masks”) (2014), which is printed on the cover and dividers of this edition, uses augmented reality. In fact, ORLAN aims to go beyond Beijing’s opera rules that forbid women to interpret their own roles. This series has been exhibited by Galerie Michel Rein, which also represents the artist.